Our rotary year is in full swing for the Holidays! So far we have raised funds for our annual food basket giving and have donated, a new record for the club, 17 food baskets to needing and deserving families located right in our own comunity. Our Holiday Auction and Party was held at O'Malley's Rockcliff and again this year it was a great success raising needed funds to help our club continue to accomplish our motto of Service Above Self. Special thanks to Mark Miller, Dale Heynik and the many members and friends who helped make this years Wreath Sales Fundraiser a tremendous success. We surpassed our sales from last year and the wreaths supplied to us were outstanding. Don't forget George Newman's annual New Year's Eve Bash. Details can be found on our Calendar of Events page. I want to wish each and every member of our Rotary family a wonderful Holiday Season and we look forward to our next club meeting to be held Tuesday January 9th at the 100th Bomber Squadron. Once again our annual holiday party and auction was a huge success. The food was great and much holiday cheer was provided by our very own Rotary Singers! Much thanks for the hard work of our website committee. We have one of the finest rotary club websites anyplace. If you haven't visted our website lately, please take a look. Sales of our Fresh and natural 21 inch wreaths surpassed last year. Our thanks go out to members Dale Heyink of Puritas Nursery and Mark Miller who managed this year's committee. In addition to the sales, good fun was had at the annual "Tie One On" Bow Tying Party held at the nursery. The dictionaries have been lableled and are all set for delivery after the holidays. Every child attending 3th grade in Fairview Park schools will be given one dictionary courtesy of our Rotary Club! If you would like to accompany committee chairperson, George Newman, as he delivers the dictionaries, please see George. 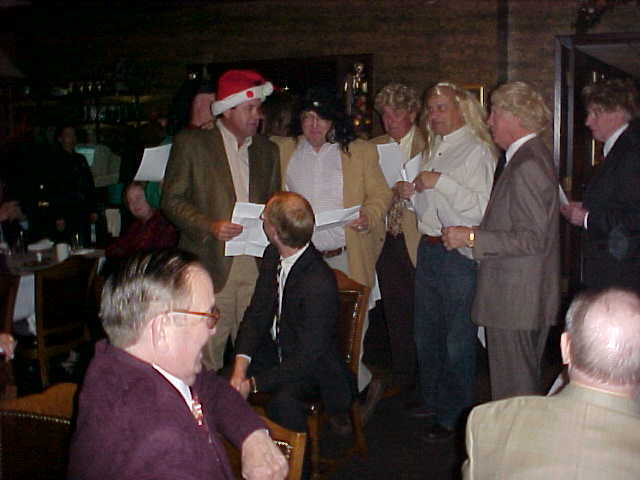 CHRISTMAS PARTY & AUCTION - See featured article for Details. Club Meeting followed by Board Meeting. Club Meeting - Call Jim Corrigan to book a program speaker. 440-567-8779. I, George Newman's annual New Years Eve Party. Everyone is invited. Starts after 8:30 & usually runs till Sarah Marie goes home. The address is 22515 Bard Ave. off W.227 St. in Fairview Park. There will be no meetings on 12/26/06 & ON 1/2/07.